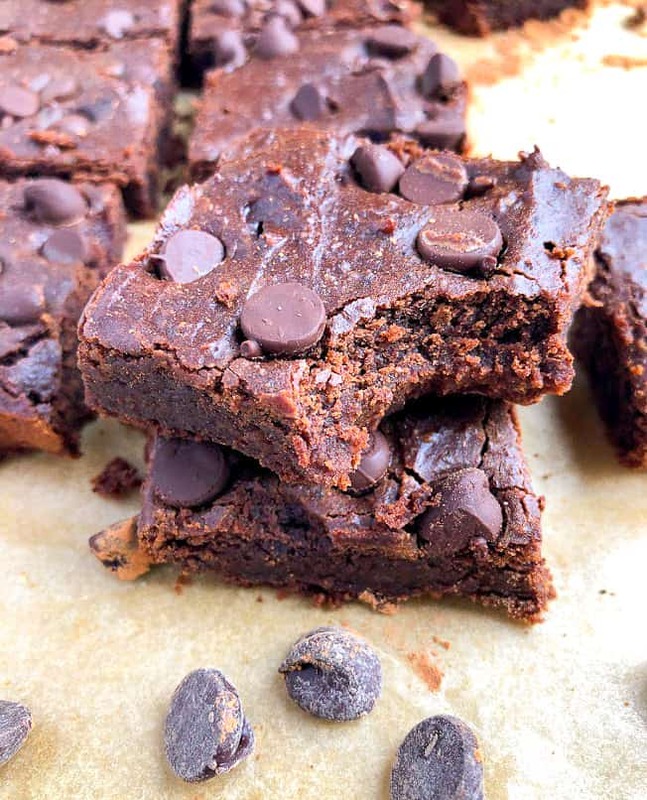 These easy vegan black bean brownies are made in less than thirty minutes, are gluten free, paleo, deliciously fudgy, and made with simple ingredients. Top with extra chocolate chips for an extra sweet treat. Its official as a whistle. I am obsessed with baking with legumes and beans and I really don’t see myself stopping anytime soon. 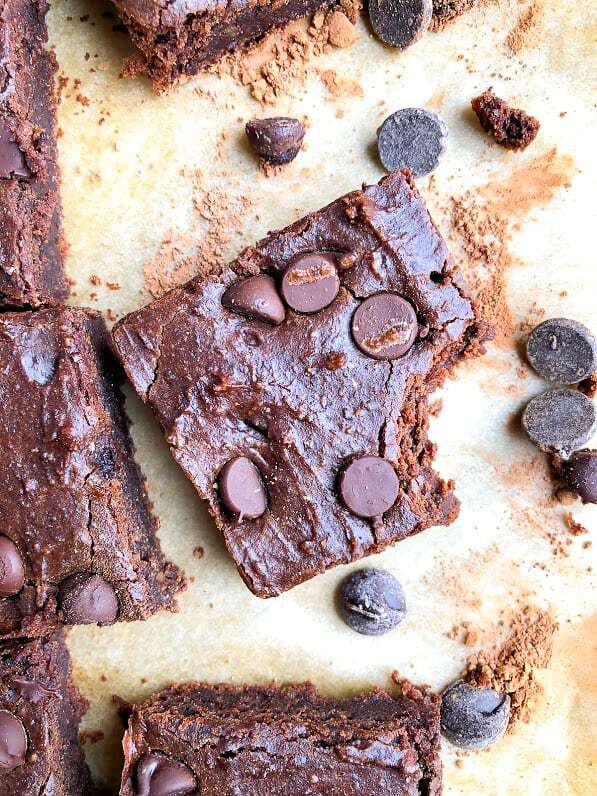 And after you eat these easy vegan black bean brownies, I’m pretty sure you won’t be stopping anytime soon either. According to the number analytics from my blog and my pinterest account, the chickpea brownies that I made are easily the most popular recipe I have on my site. I also get tagged in a new chickpea brownie post on Instagram at least two or three times a week. People LOVE them, and for a pretty gosh darn good reason. They are so incredibly fudgy, and like made from freaking beans, so they are basically like healthy as HECK. But the best part about it is that you genuinely would have no idea that they were made from beans. Like the amount of you who have made these and mentioned that you didn’t tell anyone what they were made from is impressive. 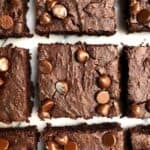 People automatically are kind of scared when they find out the ingredients, but I swear to the highest power that these brownies will absolutely blow your mind! There is something about experimenting with healthy ingredients and figuring out what works and what doesn’t is my favorite part of recipe development. Cocoa powder: I’ve found that the darker the cocoa powder, the better it tastes! More chocolate-y. Favorite brands: Hershey’s Extra Dark. Best brownies over had in a long time! 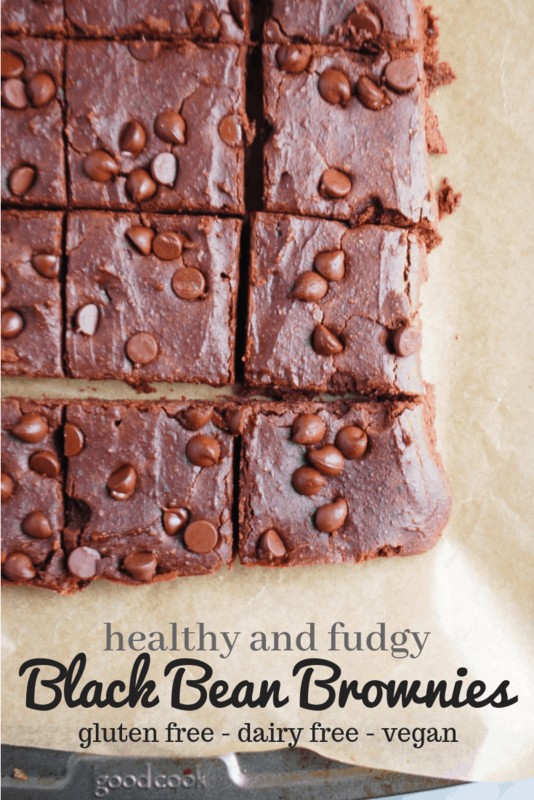 They are the softest, moist, chocolate love, fudgey brownies I think I’ve ever had! No one even knew I put black beans in them. I made a double batch putting into a 9×13″ pan cooking for same amount of time. Everyone at work it’s begging for the recipe! My husband who is picky as can be tried them and loved them even asked if I could make another batch this weekend. Erin you’re baked goods and book are by far my favorite to go off of, thank you! Do you know how happy this comment makes me?! The answer is VERY! I’m so glad you are enjoying them!!! And your hubs!! I made these with peanut butter and quinoa flour and they also turned out AMAZING! Such a great recipe! 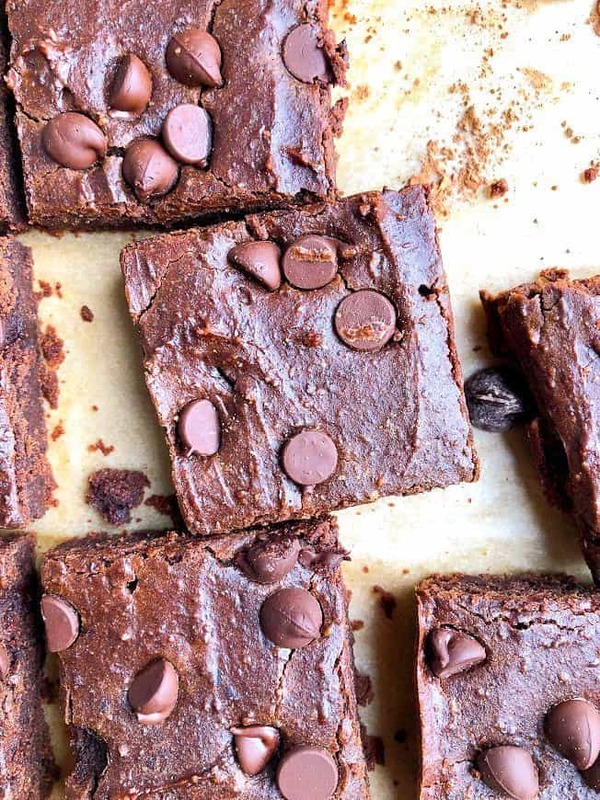 They are insanely fudge-y and you really would have no idea that there are black beans in them. My boyfriend and I devoured them! Love your recipes – thank you! YAY! Love to hear that Julia!! Thanks for the support and so glad you enjoyed the brownies! These are AMAZING! I was so surprised and so were all my friends. Thanks for crafting this magic! YES!! That’s what I like to hear!! So glad you are enjoying them! now! the fam loved them and couldn’t even tell that there were black beans in here;) delicious!!! These were seriously the best brownies I have ever made. I made them with PB instead of almond butter. They were the perfect consistency and full of flavor. My dad hates anything remotely healthy, but he ate half of the tray and wanted me to make another batch. He could not believe there were beans in these!! Thank you Erin! I absolutely love these brownies! I’ve now made them several times. They are so chocolatey and delicious! I used dark chocolate chips and Hershey’s special dark cocoa. I feel like I can never go back to your typical box mix after these. I love how easy they are to make, the wholesome ingredients, and (of course) the taste! Totally hooked! Yes Sarah!! Thank you for sharing and I think I need to try them with the dark cocoa next time… that sounds epic! These brownies are amazing! I love the fudge like consistency. I followed the recipe, but omitted the chocolate chips and they tasted great. You would never guess you were eating black beans. So hard to stop eating! 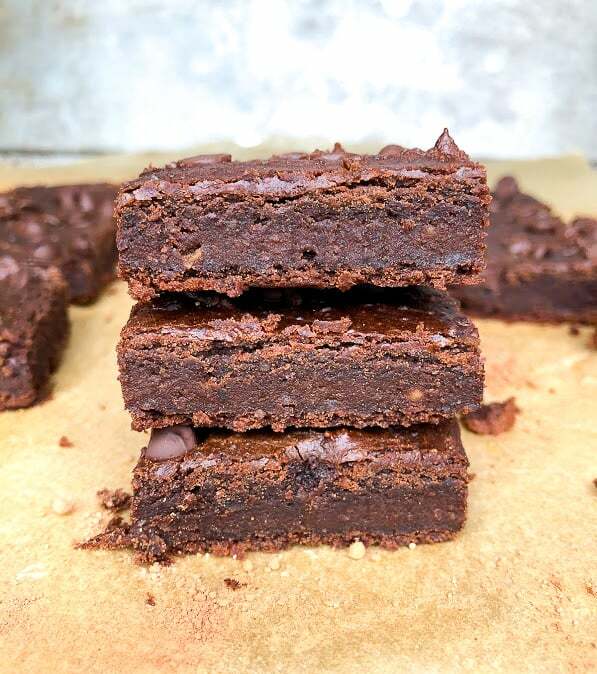 These are the absolute best brownies you will ever make!!! I have been making them weekly for months since they don’t last in our house! Thank you for creating such a healthy yet delicious recipe. I would honestly make them to eat even if they weren’t so good for me they are that good! Aw, thanks Kara!! I love to hear that!!! So easy to make and so good! Substituted almond meal for almond flour and turned out great. Can’t wait to try more recipes! Thanks Jacquelyn 🙂 I’m so glad that almond meal worked just as well as flour! !